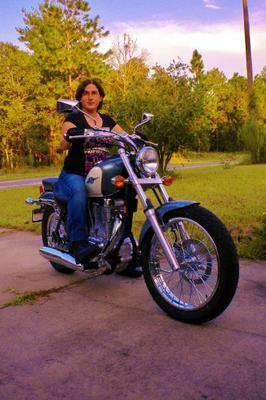 My husband decided to buy me my first new Suzuki Boulevard S40 5 weeks ago. I was so excited and finally got up the courage to take the Basic Rider Course 2 weeks later. I passed the course with perfect scores in both the written and driving tests. But I still have my ups and downs with riding. On the downside, as many state on this forum, I have trouble finding proper protection that fits. U-turns are my nemesis and no matter what I try, I struggle with them and now I'm afraid to do them for fear of dropping the bike or crashing. Also, I have short legs which ended up melting a pair of rain pants on the muffler no matter how far I tried to keep away from a hot pipe(A helpful tip I found to work on removing some melted stuff on pipes: A Magic Eraser. With a little water and a little elbow grease, it doesn't scratch the metal and it worked. I have also read and tried a method of using oven spray cleaner, which also worked. But take caution to what type of metal you use it on). On the upside, I save money on gas by commuting with my bike instead of my car. I love the feeling of freedom when riding in the open, which I don't get in a car. The cost of oil changes and small maintenance is cheaper than a car. Insurance is cheaper. And on top of it all, I enjoy trips with my husband more now that I have my own bike to ride. I do hope that I can conquer my fear and become a better rider. For now, all I can do is practice. If anyone has tips, I'm all for it!